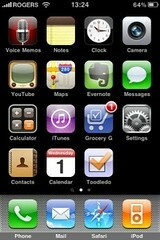 Well, I finished up my Apple collection a couple of weeks ago by buying an IPhone 3Gs. I’ve been a Palm fanatic since the first Palm Pilots hit the street and finished up with a Treo using a Telus plan. I have binders full of receipts from various apps I’ve bought and upgraded, but there was always something missing. I never knew just what that was. Now I know. The Palm has always been anchored by my desktop computer. I had to sync the two everyday and sometimes more, or get hopelessly out of date. Changes here, changes there, and before I knew it, I couldn’t be sure which version was most up-to-date. The IPhone is different. Between Google, MobileMe, WiFi and 3G, my phone, desktop and online versions of mail, contacts, todos and calendar all stay in sync, real time. If I’m at the computer and need to update the calendar, I just do it. Leave 5 min later and need that date. It’s there on the phone. What’s simpler than that. Some other apps require a WiFi connection, but that’s ok. I don’t rely on those as much as I do the others. If things get critical, I can always hit a local WiFi site and sync them up. Of course Telus didn’t handle the IPhone, so I had to open an account with Rogers. Might like it, might not. Back in the 90’s I was sad when I had to change the cable TV from Rogers to Shaw, but I got over it. My Telus account just has a few months left, so the double bill won’t last that long. I’ve been a happy Telus customer for years, so when (or if) Telus ever handles the IPhone, I might move back. Just depends on the service from Rogers, I guess. It’s been a real learning curve, but most of what I need (and more) is up and running now. There’s nothing not to like so far. Recommended. I seem to be morphing into a Mac addict. I’ve used Windows forever, and although it has a few irritations, I like it. However my experience with the MacBookPro prompted me to buy a second Mac, an IMac, over the Easter weekend. Boy is it nice for working on photos! Needless to say, the IMac is another time sink until everything is set up to my liking. Just yesterday, for example, I found that my LaCie external usb drive wasn’t working well with time machine. After a lot of angst and some research online, I found a solution that required reformatting the drive: 2 partitions, 1 GUID and 1 FAT32. That worked, and it’s backing up like a trooper now. Supposedly I can go back and reformat to one partition, but sheesh, what a production to get a backup on an external drive. Luckily, formatting with the Mac is quick and easy and everything seems to be working fine. As it stands, I’ve got the Macs networking and sharing files, mail is working, printing is working, day-to-day software is pretty well set up, and all I need to do is get my phone syncing up my mobile info. I’ll have to make some hard decisions about that, because of the number of windows-only apps on it. Perhaps I’ll just do what I did with the email and leave it all behind to start fresh with the Mac. The info will be on my Windows machine if I need to go back and find something. As they say… the adventure continues. Trying to keep up with new computers AND photography is a challenge. Fun, but a challenge. Some days the sky just amazes me. 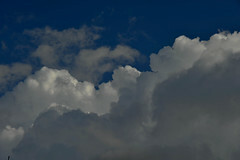 As it was clearing up today, I noticed some big, low, fluffy clouds and just couldn’t help but take a picture. Nice. It was great to get outside. After I bought my MacBook Pro last week, I started to realize how much I had to learn about working with a new operating system! That’s kept me inside for most of my free time. And no matter what the rumors say – Macs don’t ‘just work’ all the time. At least they don’t if you know nothing about them to start with. So far I’ve grazed through networking, installing software, copying and pasting files, syncing up my google account for mail and calendaring. I’m getting there, but there is still a long way to go. I mean, what’s with the delete key that works backwards? Aaahhh, those lovely html emails with beautiful images that don’t show up when images are blocked, or carefully layed out pages that don’t shrink to fit the preview pane. I can’t count the number I get from various advertisers of online products, office supplies, or software, that are like downloading a webpage that’s not set to fit in an email preview pane. Most of them just get boosted into the delete folder after they’re marked read. The curious thing was that the email from Marketing Sherpa was set out in two columns – advertising and images on the left, and the content extending well past the right margin in my preview pane. Hmm…well, it sounds like 74% of readers prefer their reading panes horizontal, under the message. I keep mine on vertical, on the right – 26% prefer that. The article offers some help to deal with images and advertising. Worth a read if you get some time before the 14th. I picked up a post from Jim McGee at Corante tonight that talks about how marketing is changing. It’s a good summary of some of the effects of ubiquitous computing and web 2. What really hit home for me was the discussion of promotion. It use to be in the marketer’s hands, but now, word of mouth marketing and the availabilty of online information is taking that power away. I read somewhere once that doctors were having a time of it because patients come into the office only after researching their symptoms; and car dealers often knew less about the cars they sell than buyers coming onto the lot ( sorry, no links). Not to prolong the discussion about long vs short posts, but I bit the bullet last night and moved any short-post blogs to a separate folder. I may or may not keep up with them. It won’t make a lot of difference, I guess. It’s just one reader leaving that got tired of having to bounce around to read someone’s thoughts every time the feed came up. During a speed read through my feeds today, I did notice an interesting technique though, . It might be a compromise of sorts. The author (sorry, I forget who) provided a perspective with a link on something longer that they’d written. Somehow, once I’d read the ‘abstract’ and a sumary of his thoughts about the subject, I didn’t feel too bad about opening up a browser to read more. By that time I knew it could be worth more time and thought on my part. I must find that blog again….. Via SmallBizBlog we get the news from ITbusiness about a move to provide wireless access in Canadian cities. Bell Canada and Rogers Communication are working on such a deal right now. That’s somewhat good news, I think. But the deal should be bigger and include other service providers too. Shaw and Telus come to mind in BC, for example. What if all the access providers contributed a portion of our monthly fees to pay for sharing and maintaining the ‘pipes’, so to speak. We could choose a provider for service, price, logistics, or convenience at our main base, and from then on, have access to the internet. Period. The providers would have a chance then to win our hearts and business (hah). I think the cell companies call it ‘roaming’. Overly expensive the way it works now, but it does work in a pinch. Certainly better than having a separate account for each and every location you might want to call from. It’s fine for these large companies to set up additional proprietary networks, but if we want to really exploit the internet for all it’s worth, we can’t all be cloistered around our individual service providers for access. People move around to do business these days, and business and the internet are inextricably linked for most of us. The ITbusiness article also notes a push for cities to provide free wireless access as a public utility. There’s been lots of arguing about this in the US as well. Free internet services may or may not be good idea, but somewhere, someone has to make enough money to keep the ‘pipes’ working. I’m not sure another tax (+GST) is the answer.